By now most of us have gotten used to this Christmas business. There are lights and trees and presents and Jesus being born and shopping and baking and going to church and getting ready for family visits and . . . and the list goes on. We're used to it by now. We're used to the Christmas routine, both religious and non-religious. Perhaps we are a little too used to it. Because Christmas is based on an absolutely outrageous claim. Most of the time, we don't concern ourselves too much with the outrageous claim that Christmas is built around. We are simply too busy to take the time to stop and think. Fortunately, those of us who are able and willing to come to church have something precious that most of our non-churchgoing brothers and sisters have to work a lot harder to achieve: we have a peaceful hour in which we can set aside all those other concerns and focus on matters of deeper meaning--on matters of God and spiritual life. This morning, I would like to use some of that peaceful hour to stop and look at the outrageous claim that Christmas is based on--a claim that our church brings to the limit of outrageousness. That is the claim that God became a flesh and blood human being--and that God became a flesh and blood human being not just in some theoretical, idealized way, but in the very specific and sometimes very inconvenient and even irreligious life of Jesus Christ. It is hard enough to grasp and accept the idea that an infinite, eternal, all-powerful being--the creator of the entire universe--could be squeezed into a tiny, limited organism like a human body and live in it for thirty years or so. It becomes even more difficult when we actually read the Gospels and find out that this human life was full of iconoclastic, confusing, and sometimes downright strange statements and actions. Cursing a fig tree so that it withers and dies (Mark 11:12-14, 20, 21). Making a whip out of cords and chasing people out of the temple (John 2:15). Disowning his mother at a wedding reception (John 2:4). Comparing a foreigner--a Canaanite woman--to a dog (Matt. 15:26). Breaking religious laws right and left. The skeptics who claim that the whole Jesus story was made up have a serious problem with their position: If someone had wanted to make up a great religious figure to found a religion upon, they certainly would not have come up with such a quirky, human Messiah figure. The committee that put together the Gospels would have done a much better editing job, and smoothed over all those inconvenient and confusing passages that to this day cause many people to shake their heads in disbelief. But the figure named Jesus remains a stubbornly human figure. Oh, in our church we like to explain away the difficult passages. The reason Jesus cursed the fig tree, we say, has to do with correspondences. This corresponds to that, and this corresponds to that, and therefore we don't have to worry about the inconvenient literal significance of the story: Jesus was hungry, came to an out-of-season fig tree which, being out of season, had no figs on it, and then cursed the fig tree so that it withered and died. We can also interpret the story of Jesus and the Canaanite woman through correspondences, and explain away what certainly looks like a story of a man showing prejudice against foreigners--referring to them as dogs--and then having that prejudice overcome as the foreign woman responds, not with anger at the insult, but by continuing the dialog without offense, building on Jesus' own words to continue her request for healing. Somehow, I have a feeling we are not meant to explain away all the difficult passages in the Gospels through the use of correspondences. Yes, it is true that we can gain great insight through looking beyond the literal meaning to the deeper meanings within scripture. But the literal meaning--the stories themselves, the memorable personalities and challenging, hard-to-understand statements and actions--the literal story is where our own humanity is most strongly challenged. This Jesus is a person that we can both relate to and not relate to at the same time. When he becomes angry or sad or joyful, our own hearts respond--because we, too, have felt those emotions. We know what it is like to have someone betray us. We know what it is like to lose someone we love. We also know what it is like to have a great breakthrough in a relationship with someone we love. These experiences are all part of the human condition--and Jesus shares these human, heart-driven moments with us. Yet Jesus also goes beyond our experience. No matter how mad we get at a tree that doesn't have any fruit on it just when we've got our heart set on a nice, juicy apple, that tree is not going to wither away. If we walk by it the next morning, there it will be . . . and it still won't have any fruit on it! And then there are those strange, cryptic speeches that the Gospel of John is especially full of. What do we make of them? The Lord's teachings are often wonderfully practical--such as the rule that we should do to others what we would like them to do to us. But almost as often, the Lord's teachings go beyond our grasp . . . and the words seem to go in one ear and out the other. The life of Jesus is a life both common and uncommon; a life we can understand and not understand, empathize with and shake our heads at with bewilderment . . . all at the same time. Yet in all this, there is no denying that it is an intensely human life, filled with all the ups and downs, the triumphs and disappointments, of human life on earth. And the outrageous claim of Christianity--and of our church especially--is that this life is not simply the life of a great, inspired human being; rather, it is the life that the infinite God chose to live as the only child of the divine being. 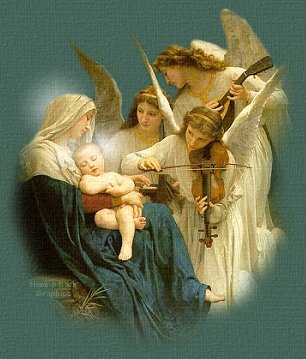 In the words of our text, "The Word became flesh and made his dwelling among us. We have seen his glory, the glory of the Father's only Son, full of grace and truth" (John 1:14). How could this be? How could the infinite God live in a human body? And how could it turn out to be this particular life on this particular earth? These are questions we can ponder for our entire lifetime--and I make no pretensions of answering them in one short sermon. But if we wish to celebrate the spirit of Christmas and not just observe the outer trappings--if we wish our Christmas to be a spiritual event, and not simply our culture's biggest festival of the year--then we must grapple, both in our minds and in our hearts, with this amazing, outrageous claim of Christianity: that in Jesus Christ, God became a human being and lived among us. Even though we will never fully succeed, we must make the effort to wrap our minds and hearts around the idea, as Swedenborg expresses it, that the Lord Jesus Christ, whose birth we celebrate at Christmas, became and now is the perfect human being, and the only truly and fully human being. This is the heart of our religion. And I emphasize the word "heart," because if we merely try to wrap our minds around this amazing, outrageous claim, we will never grasp it to the fullest extent and depth that we are capable of. For it is precisely the strength of human emotion in the life of Jesus that reaches out to us, that pushes beyond the intellectual skepticism that our minds can engage in, and reaches out to our emotional centers where the true essence and source of human life lies. When God reached out to us as a human being--when God was born as Jesus Christ--there was no need to impress us with a logical and oratorical tour-de-force that would overcome our every doubt and answer our every question. For God knew that it is not our minds that make us tick; it is our hearts. And when God chose to come to earth and be with us, the goal was to reach to the human essence within us--to our loves and hates, our pleasures and our pain, our sorrows and our joys. We are human, yes. But we are only partial humans. We do not live up to our full potential as human beings. We always seem to stop short of fully expressing the spiritual heart that beats within us. But God is infinitely human. God has no limits, no boundaries. God is able to take a single, fragile human life, and pour all the infinity and eternity of the divine into that life. God is able to come to us as a baby, to grow up as Jesus the Christ, reaching into our finite world--and into the finite hearts and minds of each one of us--from the infinitely human center of love and wisdom that is the being of God. This is what we celebrate at Christmas. The trees and lights, the candles and Christmas feasts, our gifts for each other, both physical and emotional . . . all these bits of warmth and light that we surround ourselves with at Christmas are reflections of the infinitely human warmth and light of God coming to us and living among us--living in our hearts and minds, and in our lives with each other--as our Lord and Savior, Jesus Christ.